Wearing the right underwear when hiking is pretty important. It keeps you warm, it keeps you dry, it keeps you comfortable. But there are so many to choose from! That’s why we researched some of the top-selling products and most popular brands to put together these women’s hiking underwear reviews to help you find the right pair for you. Before we get started, let’s take a look at some of the key features you need to know about before you shop. Type: We really found a nice variety that includes separate shirts and bottoms as well as sets to cover all the bases. If you need a full set or just some warm leggings, you’ll find something perfect in our reviews. Age: Most of these are women’s sizes but we also included a couple of options for young girls. In fact, the size range covers toddler sizes through school aged girls. They even come in a variety of colors, including white, grey, and pink. 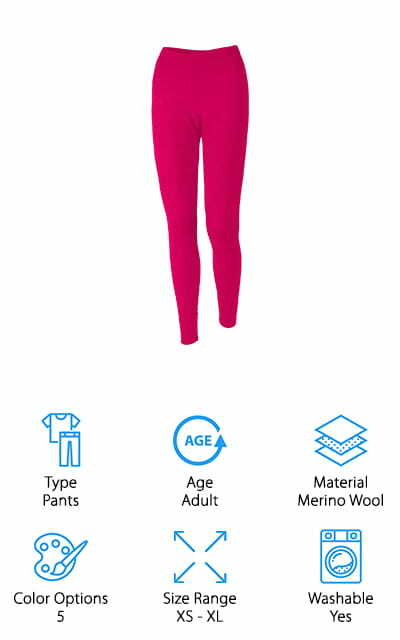 Material: Merino wool is one of the most popular fabrics but there are some undergarments made of cotton, polyester, spandex, and even silk. All are snug enough to avoid bulk but are also designed so they don’t inhibit movement at all. Color Options: Some of these garments come in a lot of different colors. You can even find some really bright and bold options. That said, just about every item we reviewed is available in a couple of standard colors. Size Range: A lot of the items we reviewed are available in a range of sizes from extra-small to extra-large. For all of you plus-sized ladies, don’t worry. There are options available all the way up to XXXXL. Machine Washable: While most of these items are machine washable and can tolerate a cool dryer, hand washing is usually a better option. Hand washing is more gentle and, with proper care, this underwear can last a really long time. Now that you know what to look for, let’s move along into our reviews. Here’s the deal: we put our top and budget picks right at the top of the list. That way, if you’re in a hurry, you can still find out a little about the range that’s available. Because these products are all so different, you should stick around through the end of our list if you can. We think you’ll find something you love. Alright, let’s get going! 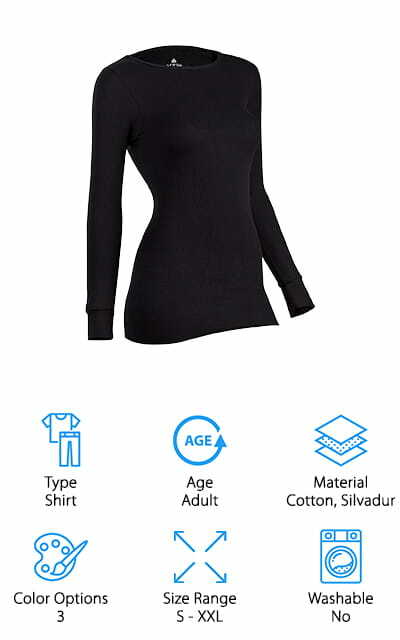 Our pick for the best underwear for hiking is this Meriwool Baselayer Crew long-sleeved shirt. The 100& natural merino wool material is superfine and really comfortable. That’s not all, it’s also naturally antibacterial and anti-odor. It doesn’t itch, is machine washable, and dries quickly. It even as a loop for hang drying in case it gets wet while you’re camping or hiking. This makes a perfect base layer for cold weather adventures or a mid-layer in warmer weather. Because it wicks moisture naturally, it can keep you comfortable in a variety of weather conditions. The long sleeves have cuffs that help them stay in place, too. This shirt is available in a variety of sizes and comes in 5 different colors: black, gray, white, berry, and purple. The best cheap hiking underwear on our list is our budget pick, the Terramar Thermasilk Top. Believe it or not, this shirt is made from 100% silk. The pointelle knit adds texture and helps regulate temperature to keep you cool without any added bulk. It’s comfortable, soft, and one of the most luxurious shirts you can possibly wear while hiking. The all-natural fabric is woven from jersey silk made up of individual strands from the silk cocoon. This fabric has a natural stretch that moves with you and a scoop neck for added comfort. The cuffed sleeves keep everything in place and prevent cold air from getting up your sleeves. This shirt is available in sizes XS to XL and comes in two basic colors, black and white. While it is machine washable, hand washing is recommended. Fitextreme Maxheat Underweaar is available as a shirt, a pair of long johns, or a set that includes both. Both the top and bottoms are lined with premium fleece material that’s smooth, soft, and keeps you warm in cold weather. It also has flat, secure seams to prevent anything from rubbing against your skin. In addition to superior thermal retention, this material also has effective sweat wicking properties to help you stay dry. Plus, it’s really lightweight and quick drying just in case you do get wet. Although both the top and bottoms have a compression fit to keep it from being too bulky, the four-way stretch material on the outside allows for plenty of freedom of movement. Choose a shirt, pair of bottoms, or a set of both. They’re all available in black, light gray, and dark gray. This ColdPruf Base Layer top is the best thermal underwear for cold weather hiking that we found in our research. The ring spun cotton material is super soft and comfortable and rated for low to medium activity in cold to very cold weather. It’s tagless and has flat seams that keep anything from rubbing against your skin which can be really annoying, especially when you’re wearing it as a base layer and have another top and jacket over top of it. Another good thing about this shirt is the fit. It’s designed with an athletic, comfortable fit that’s snug enough to eliminate any bulk while still allowing comfortable movement. With an athletic front and back rise and extended body and sleeve length, this shirt provides the right amount of coverage for cold weather adventures. So far, we’ve covered a lot of great shirts but if you’re waiting for an awesome pair of long underwear, never fear. The Meriwool Baselayer Bottoms are made of 100% superfine merino wool. They’re soft, comfortable, and perfect to use as a base or mid-layer depending on the weather. These leggings are quick drying and even have a loop to hang them up for drying while you’re camping. 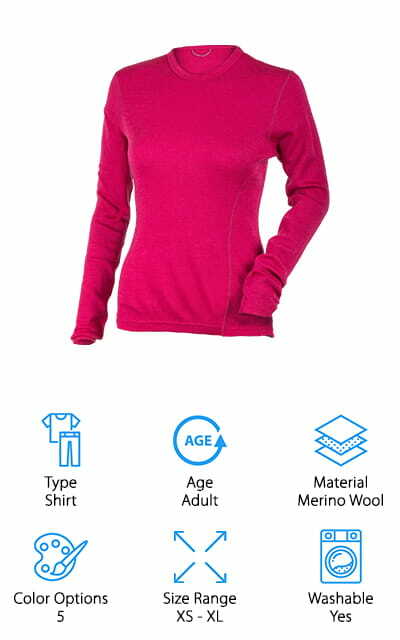 Merino wool has a lot of natural qualities that make it such a great choice for this kind of garment. It naturally wicks away moisture to help you stay cool and dry. Plus, it has anti-bacterial and odor-resistant properties that come in really handy during a long day in the woods. These leggings are available in sizes extra-small to extra-large and come in 5 colors. Next up in our hiking underwear buying guide is a great choice for the little lady in your life and is actually quite a bargain. 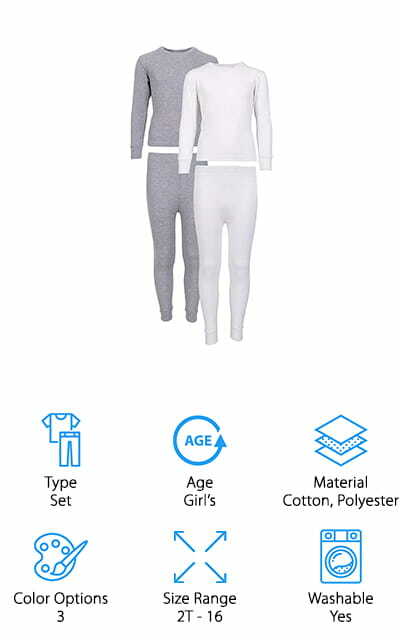 Sweet & Sassy Thermal Underwear sets come in a wide range of children’s sizes, from toddler to size 16. The soft, comfortable fabric is seamless, breathable, and can be work as hiking underwear or just to lounge around the house. They’re machine wash, tumble dry, and made with hypoallergenic dyes and no harsh chemicals. In other words, they’re safe for your daughter’s sensitive skin and they’re really easy to take care of. And here’s the kicker, you get 2 complete sets of underwear with every purchase and they’re actually really affordable. They come in the following color pairings: light grey and white, hot pink and charcoal, and lavender and medium pink. 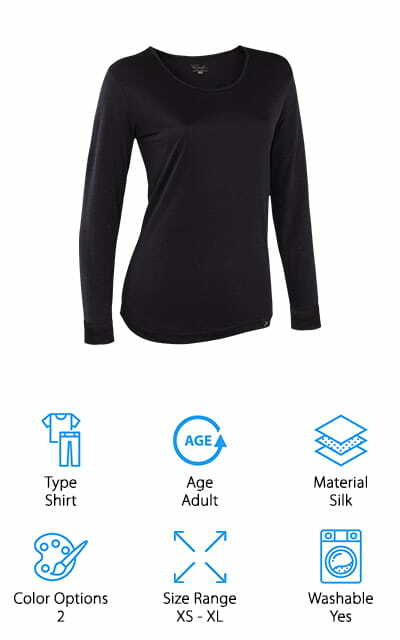 For the best women's hiking underwear that’s rated for extremely cold weather, take a closer look at this Icetex thermal top from Indera. Here’s what’s so great about this shirt. The outside is made of 100% cotton while the inside is 100% Silvadur. You might be wondering, what is Silvador? Well, it’s an antimicrobial, polymer containing silver fabric that uses silver ions to kill microbes and prevent odor and breakdown. This shirt has moisture wicking technology and dries really fast. The fit is really great. It’s tight without being restrictive and adds warmth without piling on any bulk. 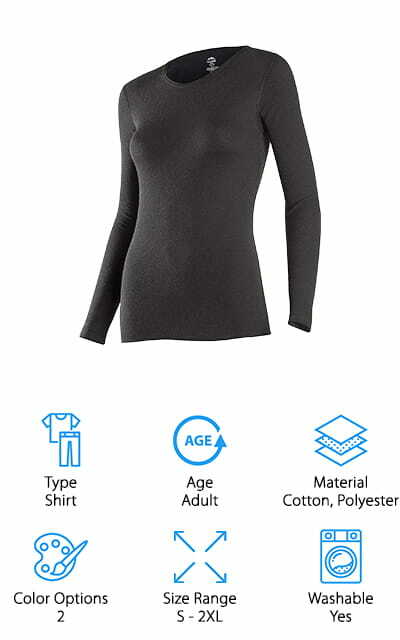 This shirt is a great choice for a base layer. It offers more sizes than some of the other items we reviewed, too, going all the way up to XXL. Choose from 3 colors: black, white, or pomegranate. Another great pair of pants to check out are ColdPruf’s Quest Leggings. They’re a super comfortable yoga style legging with an athletic rise and thick waistband for ease of movement. 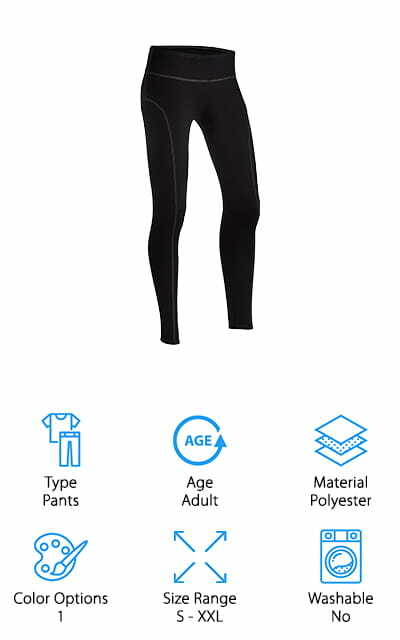 ColdPruf makes sure that their women’s pieces are truly made for a woman’s body which is why these pants have comfortable feminine waistlines and double layers for warmth in any frigid environment. And get this, to make sure they’re comfortable in every way, these pants are tagless and have flat seams so nothing rubs against your skin and causes irritation or discomfort. The material is performance polyester with Silvadur to fight bacteria and prevent any odor from developing. These pants are rated for low to high activity in cold to extreme cold weather. 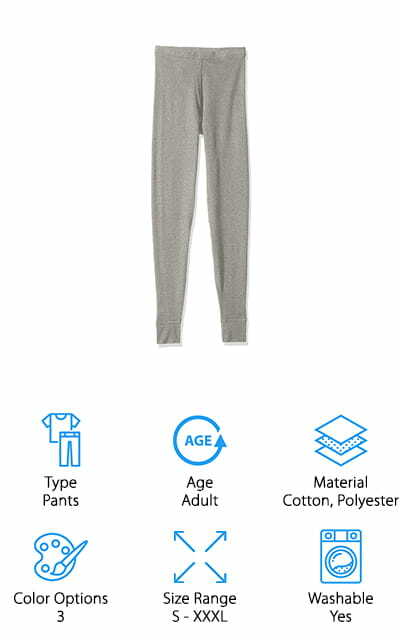 These pants come in sizes small through double extra-large and only come in black. Another great choice for best hiking underwear for girls are these sets from Snozu. 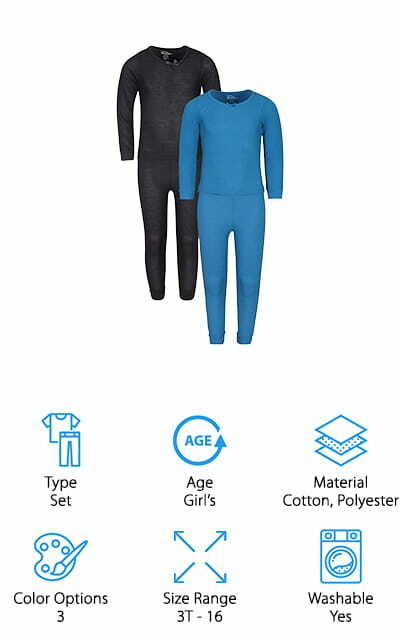 They’re made of super soft cotton and polyester that has a snug fit to deliver enough heat without using too much fabric. 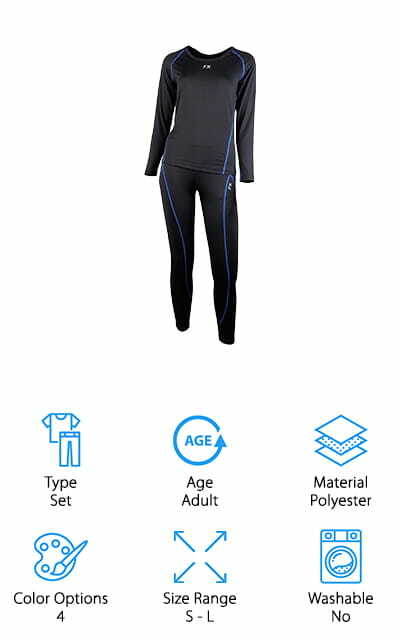 This is a great base layer because it won’t restrict movement. It’s also moisture wicking and breathable to keep your little girl dry when she’s playing hard outside. The waffle weave pattern is perfect for temperature regulation and the string seams and ribbed cuffs keep cold air from sneaking in elsewhere. At the end of the day, you can toss these in the washing machine and tumble dry. You actually get 2 full sets when you order this one and there are 3 different color combinations to choose from: black and turquoise, light grey and fuschia, and white and grey. Our last pick is from Hanes, a very well-known name in underwear. Their Ultimate Thermal Pants are made of a soft waffle knit that regulates the temperature. Hanes uses X-temp technology which keeps you cool and dry by adapting to the temperature as well as your environment and activity level. These pants are tag free and have flat seams so there’s no rubbing or itching. They really keep you warm without adding a lot of extra bulk. Plus, the thin fabric and snug fit move with your body without restricting anything at all. They’re even shrinkage controlled. One of the best things about these pants is that they come in a lot of sizes. In fact, they’re the only product on our list that goes up to XXXXL. They’re available in black, charcoal, and white.